ASK THE EXPERTS: IS IT POSSIBLE TO LOVE WATERMELON TOO MUCH? - What About Watermelon? 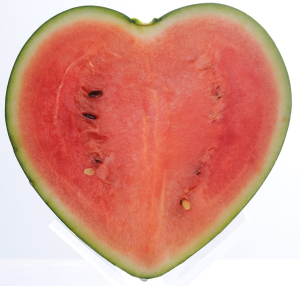 You are here: Home / Nutrition / ASK THE EXPERTS: IS IT POSSIBLE TO LOVE WATERMELON TOO MUCH? VICTORIA S. ASKS: I’m a huge watermelon fan. Seriously, I could eat it for breakfast, lunch and dinner (and I have!). But my question is, is it possible to love watermelon too much? Ever since I could spit my first watermelon seed, I knew I would be a lifer in the watermelon lovers club. (By the way, the watermelon lovers club isn’t an actual thing, but if I had my way, it would be!) It sounds silly, but one of the reasons I’ve been eating watermelon so long (and so often) is for the nutritious advantages it packs. Don’t get me wrong: I also love watermelon because it tastes like a little slice of heaven. Then again, I also think chicken nuggets are delicious, but I don’t eat those all the time. But is there such thing as too much watermelon? We asked our nutritionist, Elizabeth Somer, MA, RD, this same question. As she discusses weight management and healthy habits, she says that colorful fruits and vegetables are your best friends. “They are rich in fiber and water, which help fill you up without filling you out,” she says. When it comes to watermelon, the nutritional benefits are plenty. It’s high in vitamins A and C, it’s 92 percent water, and it’s a key source of potassium. Watermelon also has no fat, cholesterol or sodium, and it’s just 80 calories per serving. I could go on and on, but I think you get the point. So, to answer your question: no, there’s no such thing as loving watermelon too much. However, I will echo some of Elizabeth’s advice and remind you to maintain a balanced diet consisting of many different foods. My biggest fear is that I’ll eat too much watermelon and eventually get tired of it. It hasn’t happened yet (and likely never will), but why take that chance?